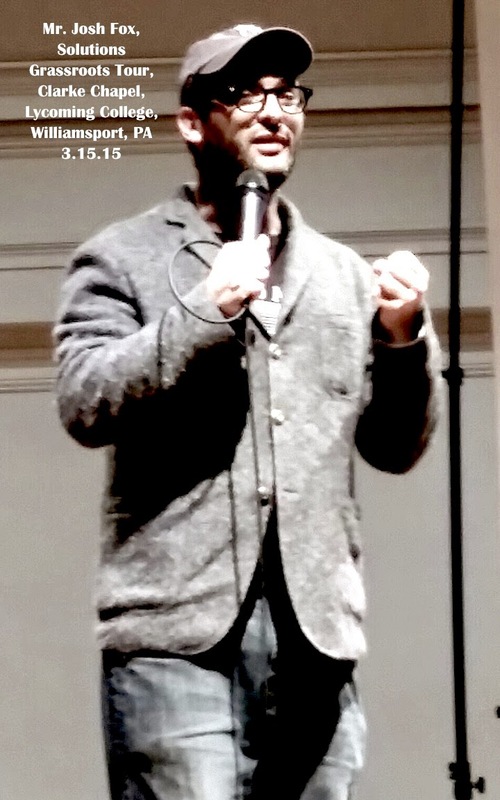 About two thirds of the way into Josh Fox' Solutions Grassroots Tour performance at Clarke Chapel, Lycoming College, Pennsylvania, I and my partner, Kevin Heatley, got up and walked out. We weren't noisy--but we were definitive. I could say that Fox' gig just wasn't very well put together (it wasn't), or that it seemed pretty cheesy on the side of a pitch for his new installment in the Gasland documentary series (it was). I could say that the "theater" promised in the trailer was wholly MIA, and that it wasn't much of a concert--but the surprise musical guests were really really great. Nope, I got up and walked out because the Progessive Democrat brand of politics being sold to an audience mostly made up of all the usual anti-fracking movement suspects--and no one really new--is a recipe for reinforcing the very system of commodification and exchange that generates endemic social and economic injustice and--through both willful blindness and the demand that the solutions be easy--contributes to climate change. We walked out because it's just not true that we Westerners can keep consuming practically everything at the massive level we do, and that--just by the easy-peasy switch from centralized fossil fuel production to centralized solar and wind--we're actually making a substantial difference. 1. Corporatized solar/wind is as much a privatizing of a public utility as were fossil fuels, and therefore every bit as much the province of the profit motive as are their predecessors. For anyone committed to the view that a system--in this case globalized corporatism--capable of converting public utilities into private profit ventures is intrinsically inconsistent with basic human rights of access to necessities like water, the prospect of any privatized and corporatized control of a centralized power grid ought to be troubling. It doesn't matter, moreover, what the resource is--if people and nonhuman animal lives depend on it, it ought not ever be a source of profit-generation. What goes for water goes for education goes for medicine goes for heat. We have precisely no more reason to think poor folks will benefit from this systemic reinforcement of a national--and global--system of economic class than we did under the fossil fuel barons--and every reason to believe otherwise. By making solar and wind power just another high stakes commodity for big corporate players, we will do damage to our communities--and we will maintain a class structure that was mirrored in that chapel: white, relatively affluent, Western. Among these chemicals is cadmium: "OSHA estimates that 300,000 workers are exposed to cadmium in the United States. Worker exposure to cadmium can occur in all industry sectors but mostly in manufacturing and construction. Workers may be exposed during smelting and refining of metals, and manufacturing batteries, plastics, coatings, and solar panels." (Safety and Health Topics | Cadmium). To be clear, considerable improvements are and will likely continue to be made in the manufacture of solar panels (see: Solar Energy Isn’t Always as Green as You Think - IEEE Spectrum). There is much to recommend them. But to blithely entrust the manufacture and marketing of solar technology to the same economic and political system that generated the conditions of deforestation, desertification, species extinction, pollution, and climate change is folly in the extreme--and that is precisely what the Solutions Grassroots Tour is doing. Indeed, just because a corporation has the word "ethical" in its name is no guarantee that they actually care about how their product is manufactured. For example, Ethical Electric--one of the companies for which Fox stumps on the tour--includes nothing whatever on their website about their commitment to insuring that their solar or wind energy suppliers from the "wholesale market" are themselves committed to fair labor practices or safe working conditions--and there is nothing on their "activism" page that speaks to these central issues. Although they claim on their "mission" page to be committed as a B-Corps corporation to "having a positive impact on the world and benefitting society," they provide no information about how they do that other than by being a renewable energy supplier company. 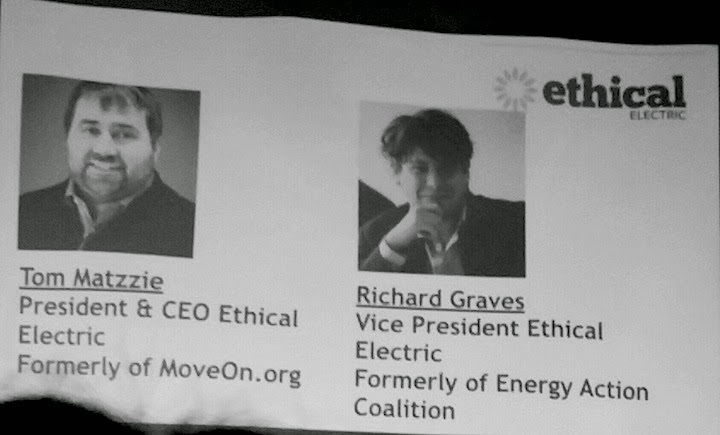 Indeed, Ethical Electric propagandizes the idea that just by signing up with them and their 56,000 customers, you're part of a "movement," a tidily cathartic claim for the activist who wants an easy way to feel good about themselves--all the while being given a pass to wholly ignore how solar panels are actually made--and by whom (Ethical Electric). To be fair, CEO Tom Matzzie could rightly respond that the 588,471 pounds of Co2 not emitted into the atmosphere since 2012 is a contribution to mitigating climate change, and that is also a contribution to an improved global environment. But this is cold comfort to the developing world laborer whose potential for toxic exposure is very likely to rise as the competition for alternative sources of energy heats up (no pun intended). [E]very wind farm has a few turbines standing idle because their fragile gearboxes have broken down. They can be fixed, of course, but that takes time – and meanwhile wind power isn’t being gathered. Now you can make a more reliable wind turbine that doesn’t need a gearbox at all, King points out, but you need truckload of so-called "rare earth" metals to do it, and there simply isn't the supply. (A Scarcity of Rare Metals Is Hindering Green Technologies by Nicola Jones: Yale Environment 360). The moral of both wind and solar technology production is the same: if the winners of centralized utility scale renewables benefit at the cost of others--especially all of the same others both at home trying to make their heating bills and in the global economies of extraction--as labor and resources--then we're just lying to ourselves that what we have are really "renewables," are a "solution" to climate change--and most of all are in any way socially or economically just. If it ain't accessible as well as renewable for my neighbor here and everywhere, it ain't really renewable for me. And to whatever extent I am participating in the reproduction of exploitive labor conditions in addition to ecologically damaging ones--even if CO2 emissions are reduced--I am still responsible for harm. 3. The number of times the word "easy" appears on the Solutions Grassroots website is designed to give us the impression that just switching over to, say, Sungevity (where you can get $750.00 and Solutions Grassroots gets $750.00 for finding the company through the tour), is a real and meaningful contribution to mitigating climate change. This is deceptive. Fact is, the word "conservation" didn't appear once in the hour I spent at the Clarke Chapel--but the notion that we in the West can continue to live the way we live, consume what we consume, and ignore what we ignore is crazy. Fact is, we haven't gotten even close to confronting one of the most significant contributions to climate change--one that all the solar panels and wind turbines in the world aren't going to affect one bit: animal agriculture. 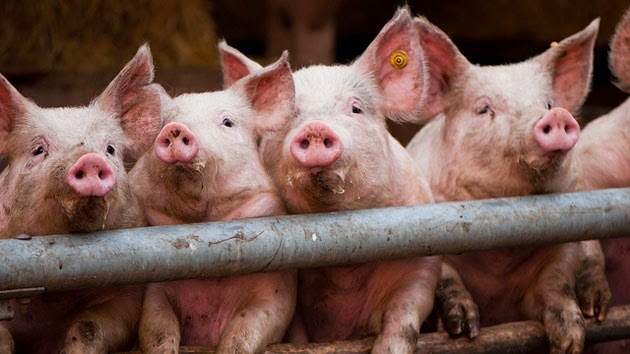 The moral here is obvious: stop eating bacon. In fact, stop eating beef, pork, chicken, and fish. Stop now. "A plant based diet cuts your carbon footprint by 50%" (COWSPIRACY: The Sustainability Secret). 1. If we put an end to animal agriculture in all of its forms--including sea and ocean--we could keep on driving our Hummers and still significantly reduce greenhouse gas emissions. 2. Conversely, we could convert every fossil fuel consuming industry, car--whatever--into a solar and/or wind-driven dream--and it isn't going to make any but the most teeny of differences to climate change if we don't end animal agriculture. 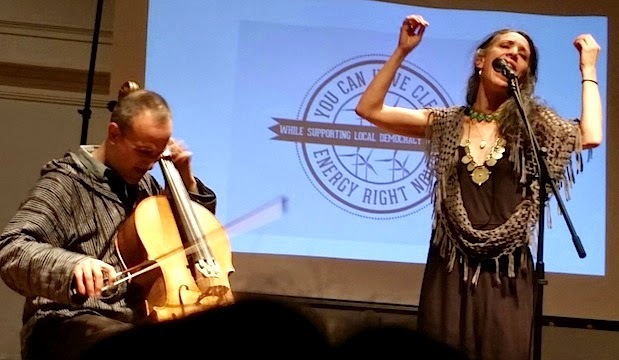 Obviously, if we really gave a tinker's damn, we'd do both--we'd stop eating, wearing, using animal products altogether--now that's easy!--and we'd head for decentralized, truly community based solar and wind solutions--with a clear eye to the conditions under which everything we use and consume is produced. 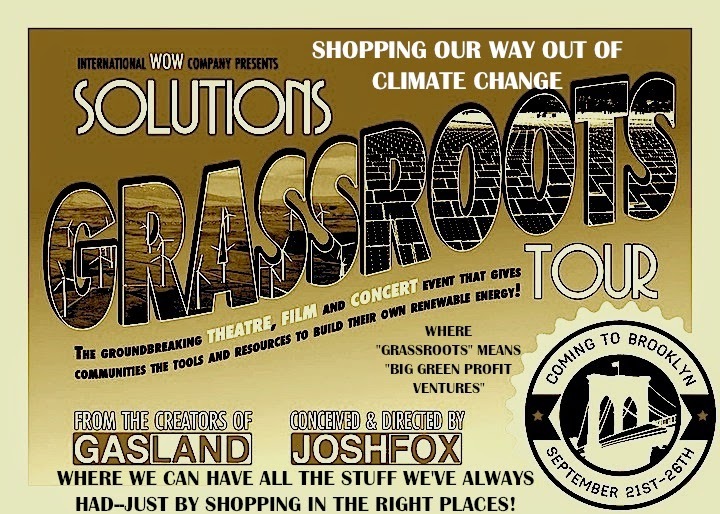 So why wasn't animal agriculture prominently featured in Mr Fox' Solutions Grassroots tour? Because there's nothing whatever grassroots about Solutions Grassroots. 1. Solutions to energy consumption. Fox' program plays like an infomercial for Big Alternative Still-Centralized Energy like Ethical Energy, Solar City, etc. And we've got no really good reason to think that these companies are any more interested in you or your community going solo than Big Gas does. Their first objective is to make a profit, and they're not going to make it off you or your neighbors if you've got it figured out for yourselves--along perhaps with a nifty community rights bill that keeps out the Big Players. Hells Bells, even if the Big Players are renewables, that by itself is no justification for sanctioning the labor abuses and environmental destruction you're buying into when you sign up with them. 2. Looking to the grassroots anti-carbon extraction community for sponsorship of his message: that the Responsible Drilling Alliance sponsored the Clarke Chapel gig suggests that (a) Mr. Fox or his people have no idea what grassroots organizing in Pennsylvania looks like, (b) Mr. Fox simply called up friends he happened to know in PA, and/or (c) Mr. Fox doesn't really care much where the sponsorship money comes from. 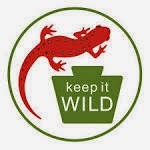 All are troubling since RDA is in no way anti-drilling. Indeed, the meme "responsible drilling" has been publicly and enthusiastically appropriated by Department of Environmental Protection's new leader John Quigley who--following the governor's lead to "have our cake and eat it too"--is now spouting the meme as the rallying cry for thousands of new wells, compressors, and pipeline. Mr. Fox mentioned that he understood the Williamsport region as the "belly of the beast." Indeed, it is--and among those he should be thanking for their contribution to the gas industry's despoiling of Lycoming County is RDA. Not only is RDA in no way "grassroots"--arguing for the protection of "special places" that are manifestly not your back yard or your working class neighbor's--they're not even anti-fracking. Given the structure of some commingled investment funds and investments in highly diversified energy companies, we recognize that there may continue to be minimal investments in out portfolio in those energy sectors, but we are committed to reducing our exposure to coal and tar sands to less than 1% of the total portfolio by the end of 2014...we are also undertaking a comprehensive analysis of out exposure to any remaining fossil fuel investments and will work with the RBF investment committee and board of trustees to determine an appropriate strategy for further divestment over the next few years. But here's the far more important upshot: Mr. Fox' Solutions Grassroots Tour is really just one more example of "in the box," "in the system," "in the Democratic Party's Political Tank" thinking. By making an infomercial for Big Solar and Big Wind, by wholly ignoring the more uncomfortable issues of conservation and animal agriculture, by making an advertisement for the "easy activism" of switching from one centralized industry to another, he effectively just creates one more apology for the same-old neo-liberalism that got us the global disparities of North and South, the 1%, the conditions of contemporary war and terrorism, and climate change in the first place. Why on earth would we think that the same centralized structures of power and wealth that got us this list of woe could get us to a desirable future--even a survivable one? It won't. Mr. Fox doesn't have much excuse for not knowing better. But this isn't really about him since neither do any of the adoring fans in his audience have that excuse. I think we have a right to expect a lot better from our leaders and heros. But "leader" and "hero" are not necessarily, I have learned, the same thing as "frack-a-lebrity," and Mr. Fox is clearly more interested in avoiding offense than mitigating climate change. But when was the worthwhile ever easy? It wasn't easy to get up and walk out of the Clarke Chapel--but to stay knowing that by doing so Kevin and I had signed on to the next fawning endorsement of the same old status quo...nah. Better to be able to sleep at night.